A lifetime of drawing and painting has established Robert Clark as an elite equestrian artist. His artwork is displayed in the homes and farms of prominent owners and successful trainers across the globe. 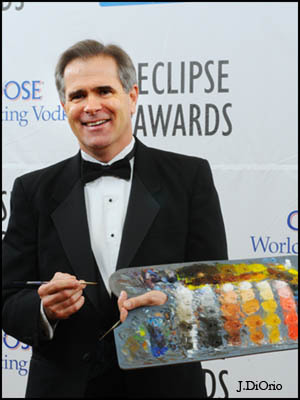 Over the past two decades, Robert has enjoyed painting many of the world’s most famous horses. He has developed a following among art enthusiasts, racing fans, and horse lovers everywhere. Whether painting live at a black tie event or in his studio with his dog, Shiner, at his feet, Robert’s mastery as a painter and his passion for horse racing combine to create canvases that freeze a winning moment into a timeless masterpiece. "It is an honor every time I receive a phone call requesting a portrait of a horse. It does not matter if it is a Kentucky Derby winner or beloved old mare that is like a member of the family; the fact that someone appreciates my artwork enough to choose me as their artist, is truly a sincere and genuine compliment. It means a lot to me and I make every effort to treat their requests with the ultimate respect and attention to detail."